This technology utilizes the complete line of Accurate™ Spherical Gold Nanoparticles, Nanorods, Microgold™, and Gold Nanowires and allows the customer to choose the fluorophore and in vitro conjugation including amine, biotin, carboxyl, methyl, maleimide, neutravidin, streptavidin, and secondary antibody conjugations. 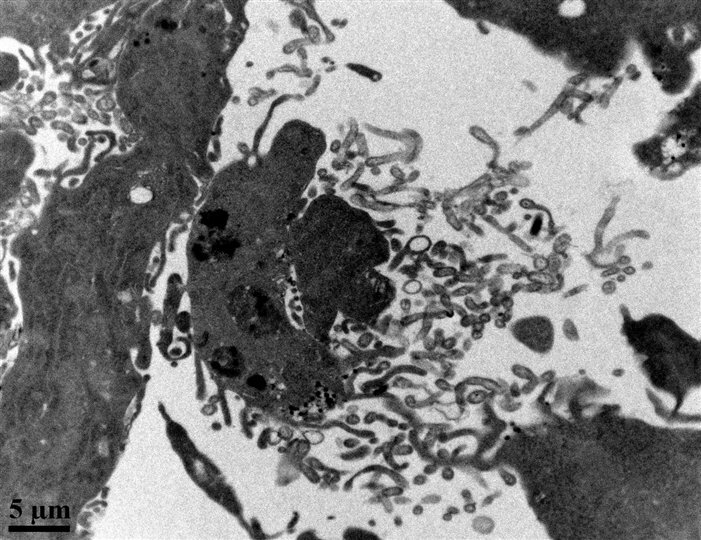 These particles may also be conjugated to customer defined antibodies, peptides, oligos, and more. These conjugated particles can be used in brightfield, darkfield, fluorescence, and other imaging modes; and ELISA, lateral flow, and other assays. Although some fluorophores may be plasmonically enhanced by the correct choice of shape and sized gold nanoparticle, the designs allow for as many fluorophores as possible to be conjugated to each, and that there be no quenching of the fluorescence. Every batch is completely characterized including size, monodispersity, and concentration. 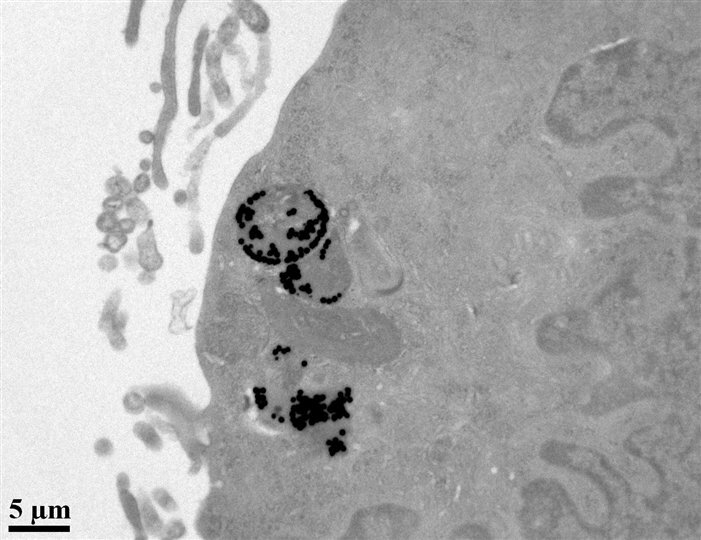 A Certificate of Analysis (COA) is provided for every order exhibiting TEM and UV-VIS images and data, as well as DLS data. "Nanopartz is sublime for their broad range of high quality products, which are, as they truthfully describe on their website of excellent quality. The fluorescent gold nanoparticles I'm using in my research are perfect: high density, stable and high fluorescent efficiency, so they're making my nanoparticle microscopy study so much easier. Moreover, their technical support is the best I have ever encountered in a company, very patient and extremely helpful and friendly. Thank you! " Functionalized gold nanoparticle with Nanopartz™ covalently bonded polymer (top) and Nanopartz™ covalent MUTAB (bottom). Thickness of polymer is less than the size variablity of the gold nanoparticle. Available with the following active groups. Methyl acts as a free acid form to be used as a non-reactive negative control. Secondary Antibody Conjugates - polyclonal provide species-specific detection of the entire target IgG class (heavy and light chains, H+L). 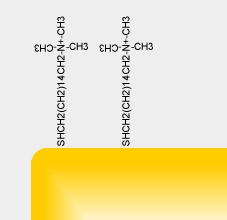 Reagents, labeling (PF/protein ratio and purification methods are optimized to provide the highest possible binding function and overall fluorescence intensity. All conjugates are stable for 1 year at 4°C, providing consistent performance for the duration of use. Custom Conjugations are also available including HRP and GSH. This product is available in 50 OD-mL and 250 OD-mL quantities, 2.5mg and 12.5mg gold, respectively. Volume is 1mL. Buffer is customer determined. All domestic shipments are sent Fed Ex Standard Overnight delivery, international Fed Ex Priority 2 day. No shipments on Fridays. This product is guaranteed for six months and should be stored at 4°C after opening. Care must be taken to only use sterile glassware when working with this product. Sterilization and Endoxtoin Free Options are available. 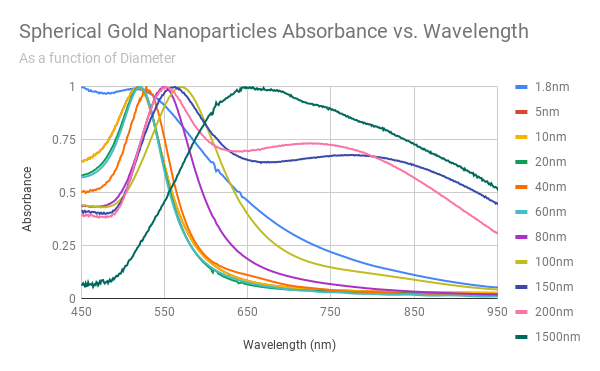 These gold nanoparticles exhibit extinctions from 500nm to 2100nm, perfect for labeling in dark field, bright field, and fluorescence microscopy applications. These gold nanoparticles come with a wide variety of covalent conjugations, specifically suited for in-vitro applications. They are resistant to high salt concentrations, and a wide variety of pHs (4-9). The customer is given the opportunity to select from a variety of buffers, and may request custom conjugations to specific antibodies. Nanopartz possesses technologies that allow for the "site specific conjugation" to antibodies, thereby keeping the ligand active for further activity. Customer has a choice for radiation sterilization (no sodium azide is used) certification and endotoxin free products. "Nanopartz is sublime for their broad range of high quality products, which are, as they truthfully describe on their website of excellent quality. The fluorescent spherical gold nanoparticles I'm using in my research are perfect: high density, stable and high fluorescent efficiency, so they're making my nanoparticle microscopy study so much easier. Moreover, their technical support is the best I have ever encountered in a company, very patient and extremely helpful and friendly. Thank you! "